If you need to mount or unmount ('map' or 'disconnect' in Windows lingo) a Windows (Samba) share from Windows command line or batch file, you can do it with 'net use' command. Click Start, and then click Run (or use Windows+R keyboard shortcut). 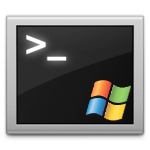 In the Open box, type cmd to open command line window.